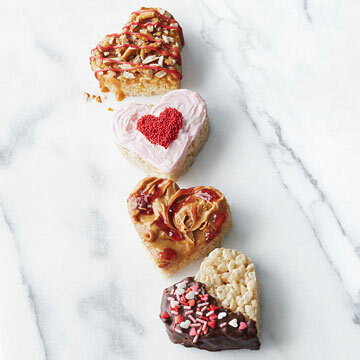 Dress up rice cereal hearts with frosting, pretzels, peanut butter, chocolate and other flavors for Valentine's Day treats. Line a 13x9x2-inch baking pan with foil, extending the foil over edges of pan. Lightly butter foil; set pan aside. In a 6- to 8-quart heavy Dutch oven melt the 1/4 cup butter over low heat. Stir in marshmallows. Cook and stir until marshmallows are melted and smooth. Stir in marshmallow creme, vanilla, and salt until combined. Remove from heat. Add cereal to marshmallow mixture, stirring gently to coat. Using the edges of the foil, lift uncut bars out of pan. Using a buttered long knife, cut into bars. To Store: Wrap bars individually in plastic wrap and place in an airtight container; cover. Store at room temperature for up to 1 week. Chocolate-Dipped Marshmallow Treats: In a small heavy saucepan cook and stir 1 1/2 cups bittersweet or semisweet chocolate pieces and 6 ounces chocolate-flavor candy coating over low heat until melted and smooth. Cut bars as directed. Dip half of each heart into melted chocolate mixture, letting excess drip back into saucepan. Place on waxed paper. If desired, sprinkle with desired sprinkles. Caramel-Pretzel Mallow Treats: Carefully spread caramel-flavor ice cream topping over cereal mixture. Sprinkle with chopped pretzels. PB&J Treats: Carefully spread creamy peanut butter over cereal mixture. Dot with strawberry or grape jelly on top of peanut butter. Using a knife or small metal spatula, swirl the jelly into the peanut butter. Frosting 'n Sprinkle Treats: Spread canned vanilla frosting over cereal mixture. Sprinkle with multicolored jimmies.